Tunisia faces three interconnected challenges: The first is overcoming its energy crisis and unsustainable fossil fuel dependency; the second is achieving economic growth to improve people’s livelihood, and the third is moving forward with political reforms. 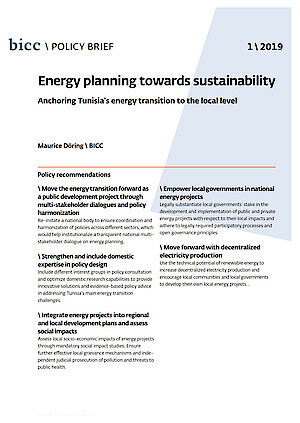 BICC’s Policy Brief “Energy planning towards sustainability: Anchoring Tunisia’s energy transition to the local level” gives recommendations on how to relate current energy planning to the country’s political transformation processes. \ Move forward with decentralized electricity production.